Adin Ballou was a man of peace — the leader of the pacifist Hopedale Community, and a major theorist of nonviolent resistance to evil. Yet he was not of a naturally peaceful disposition. From a child bewitched by swords, guns, and martial music, he grew into a minister proud of his appointment as a militia chaplain. As a young minister he engaged in theological controversy so heated that his own party urged him to moderate his language. Though he never engaged in physical violence, Ballou knew what it was like to become caught up in an exchange of hostilities, to identify with one side and demonize the other, to feel injured and to wish to injure others in return. 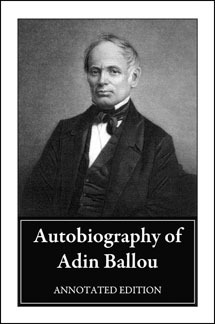 In his autobiography, Ballou tells the story of his transformation from a proud and touchy man, zealous for his own honor and that the honor of the causes he espoused, to a champion of peace, loved and respected in his own Hopedale Community and around the world.